Making donations to the soup kitchen. 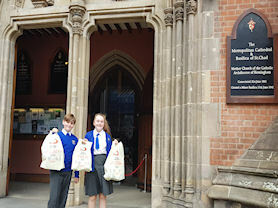 Once more we were very proud to donate bags of sugar to the Saint Vincent de Paul soup kitchen which takes place in Birmingham City Centre. This was made possible by our wonderful families who regularly donate sugar, tea, coffee and jam when their child’s class leads a Parish Mass. Soggy, but successful, members of our Running Club. 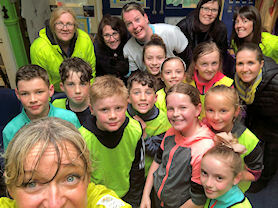 On 4th April 2019, our running club were undeterred by a bit of rain... and more rain... and more rain! Running club had pledged to run a collective marathon during one lunchtime session to raise funds towards our Lenten Almsgiving appeal. Staff and pupils were so committed that despite the poor weather conditions, they ended up running a collective ultra marathon! Thank you to all family and friends that sponsored this event. Chaplaincy Team with our Philippines visitor. Chaplaincy Team were delighted that our visitor from the Philippines was able to spare some time to meet with them to discuss the valuable work he carries out on behalf of Migrante International. We learned about the terrible poverty and injustices that the people of the Philippines face on a daily basis. We found out how the charity works to help the people, both in a practical way and also through its campaigns and awareness raising. 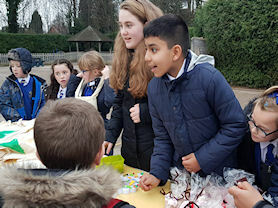 Children were keen to find out what we can do to help and we plan to show our solidarity with those in the Philippines through helping to raise awareness and also practical measures like fundraising. We will hold all those suffering in our prayers. PTFA members with two of our pupil ambassadors. 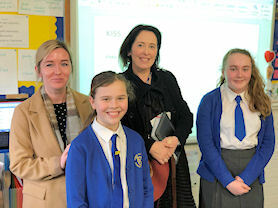 On 29th March 2019, two of our pupil ambassadors presented a proposal to our PTFA chairs. 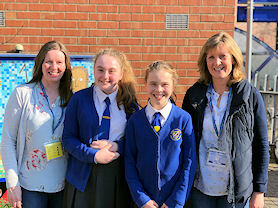 They shared how following hearing about their Headteacher’s visit to the Philippines with the Benedictine Sisters, they wanted to make a positive difference. They identified that PTFA spent £210 each year on buying each pupil a Cadbury’s Cream Egg. 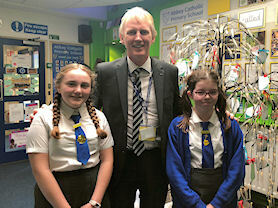 The girls spoke to the entire school staff in weekly briefing and asked class teachers to facilitate a class vote asking all pupils from Reception to Year 6 to vote on whether they wanted the money to go towards a cream egg for themselves or towards supporting the street families in the Philippines. 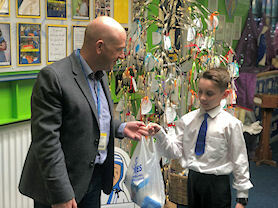 Pupils overwhelmingly voted to sacrifice their chocolate egg to help others. The PTFA were very impressed with the girls work and are presenting a cheque for £210 to school for Lenten almsgiving. This money will join other fundraising and go towards supporting Father Flavie’s work building a homeless rehabilitation shelter in the Philippines. School are very proud of these pupil ambassadors and their work for social justice. Ready to serve the soup. 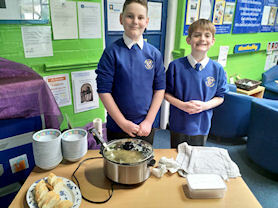 Two pupils from Year 6 organised lunch for staff. The two entrepreneurs had seen vegetables that were ready for picking and they showed their resourcefulness as they used their crops to make a delicious soup! The soup was then served with crusty bread and staff were asked to give a donation. It was so popular they served it again a few days later! These pupils are striving to make a positive impact on those around them and have made their families very proud. 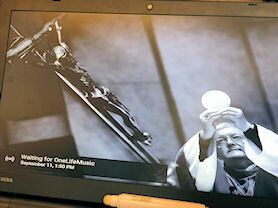 Chaplaincy Team were delighted to meet and be the first pupils to explore some new school resources entitled 'Exploring The Mass' by Cardinal Vincent Nichols. 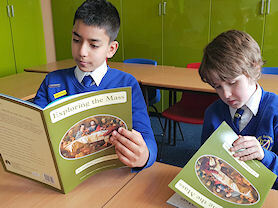 These engaging books are designed to help children understand what happens during the Mass and also to learn and think more deeply about the rich mystery. We know that going to Mass and joining in the prayer of the Church is the most important thing that we do as Catholics and this resource helps our children to understand why. Our Chaplaincy Team were very impressed with the use of images and diagrams to explain key parts of the Mass found the questions thought provoking. We are all looking forward to using these books to develop our faith and deepen our understanding so that we may share fully in the celebration of Mass. Our whole school took part in a day of sponsored cycling to raise money for our Lenten charities. 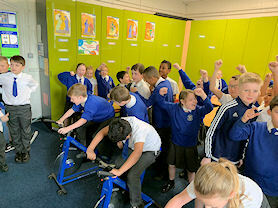 Using exercise bikes, children from each class cycled all day. This fun activity also helped us to reflect on how we can help others with donations, but also through actions and giving up our time. We raised over £250. We are really grateful to AceFitt Active Children's Exercise for the loan of their exercise bikes for this event. Headteachers on their retreat day. 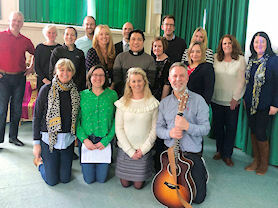 On Friday 22nd March 2019, Headteachers from across Birmingham Catholic Primary schools joined together for a Retreat Day at Selly Park Convent. 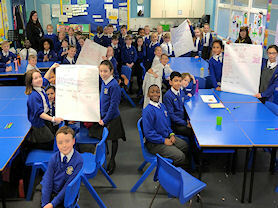 The day had been organised by The Birmingham Catholic Primary Partnership Headteachers Association. The day was facilitated by the wonderful Emily and Dan from One Life Music and culminated with the Celebration of Holy Mass. Ms Tallon and the BCPPHTA are already planning next years. Thank you to everyone involved in the planning and smooth running of the day. Ms Tallon with delegates at the National School of Formation. 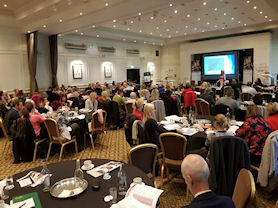 On Thursday 14th March 2019 our Headteacher was invited by Educarem to speak to delegates from Cohort 4 of the National School of Formation. She spoke about her work as an advocate for the National School of Formation and the impact this has had in school. Ms Tallon was honoured to spend time with such wonderfully inspirational Catholic leaders. 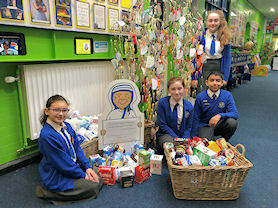 Chaplaincy team members with some of our donations. On Thursday 14th March, two of our Chaplaincy Team sorted out our donated toiletries ready to be delivered to a Women’s Refuge for immigrants in Birmingham City Centre. We are doing our best to follow the words of our Holy Father as we carry out these small actions to welcome these visitors to our city. The team at St Edmund Campion. Our Chaplaincy Team were delighted to be invited to join our local secondary school for Mass in their chapel at the start of the school day. 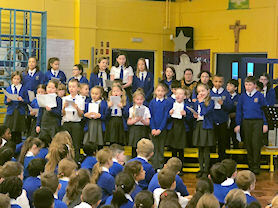 We enjoyed a lovely celebration of Mass where we were joined by the Chaplaincy Team and staff from St Edmund Campion. After Mass we all enjoyed refreshments and had time to chat and share our ideas. We hope that this is the first of many meetings and that we can work together to support each other and our local community. Showing off our letter of thanks. Our Chaplaincy Team got a wonderful surprise in the first week of March as they received a lovely thank you note from the team at Alton Castle. Chaplaincy team took complete charge of organising fundraising for the castle and raised over £100. We were delighted with our thank you letter and continue to hold the team at Alton Castle in our prayers. Year 6 stay and pray session. 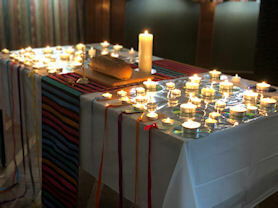 After a very successful Family breakfast, parents were invited into Year 6 to take part in our Stay and Pray Service. The families listened to the parable 'The prodigal son' and we discussed the messages. They thought about how the parable teaches them about: the value of family; having faith in each other and God; being hopeful for the future and how special we all are. Families then lit a candle on our cross as they said a prayer together. The prayer service was beautiful and emotive; It was a pleasure to spend such a prayerful time with our loved ones. Some of our donations to Fireside. Each week we join the Celebration of Holy Mass with the Parish on a Thursday morning. The class that leads the celebration of Mass are asked to donate tea, coffee or jam for the Sifa fireside centre for the homeless. 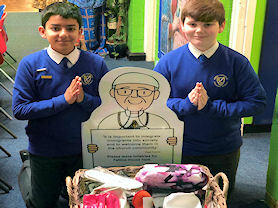 In March 2019 members of our Chaplaincy team sorted out the donations ready for delivery to Fireside. Thank you very much to our wonderful families for the generous donations. Year 5 families in the workshop. 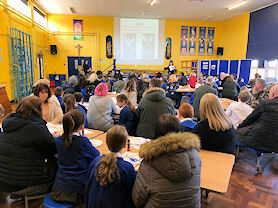 On 5th March, Year 5 welcomed their families to take an active role in the Catholic life of our school; in order to support their faith journey. The Confirmation workshop forms an integral part of Year 5's preparation towards the Sacrament of Confirmation. It was great to see so many families, who appreciate the value of Catholic life in school, attend the event. 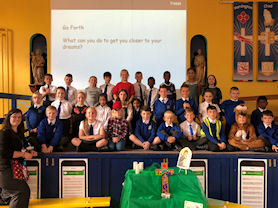 During the workshop, Year 5 were reminded of the story of Pentecost and how our Confirmation is like our own Pentecost. 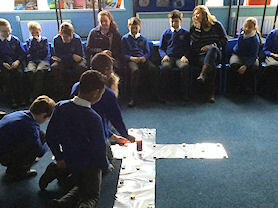 All families were asked to take part in a creative activity to remind them of the gifts and fruits of the Holy Spirit. "I thoroughly enjoyed working with my daughter, it was a challenging activity where we were able to work together and discuss the gifts and fruits she will receive." "It was really good sending time with my mom; I enjoyed making something with her and I will hand my mobile up in my bedroom to remind me." Reception's stay and pray session. 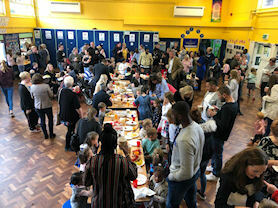 After a very successful Family breakfast, parents were invited into Reception to take part in our Stay and Pray Service. Family prayers from home were proudly displayed as a prayer focus. It was a pleasure to have families into class to share such a Prayerful time with us. Year 1 were so excited to share their assembly with their friends and family on Monday. 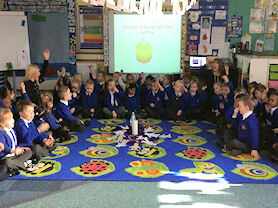 We had lots to talk about - family week, Shrove Tuesday and Ash Wednesday. The children shared the story of Jesus' temptation in the desert and how we spend our time during Lent to grow closer to God. They also decided on a great go forth message, Stop, Reflect and Pray. These signs have been placed around school to remind people to stop and look at their surrounding, reflect on what they are grateful for and what they could try harder at and finally pray. Pray for guidance and support but also pray to praise God for the opportunities he presents to us. We are glad so many people could join us to share this special time. Stewardship Team members in their first new meeting. At our recent Pupil Parliament, the newly merged Eco and Travel Team spent time discussing our team purpose, and questioned whether our new name reflects our Mission. Following on from this, at our meeting this week we took a vote and decided to change our name to 'Stewardship Team'. We all agreed that this reflects our wish to be good Catholic stewards of creation. 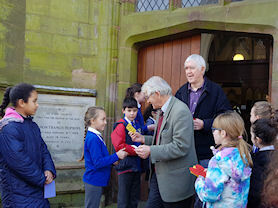 Giving Valentine's cards to members of the parish. 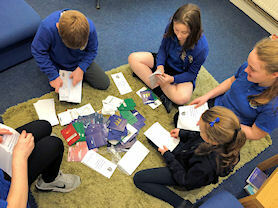 Chaplaincy Team spent part of their recent meeting making thoughtful prayer cards, giving up their own time to support the mission of our school - following in the footsteps of Jesus with our Parish. Our team enthusiastically chatted to parishioners, who were really touched by the thoughtful gesture. Members of our Chaplaincy Team. 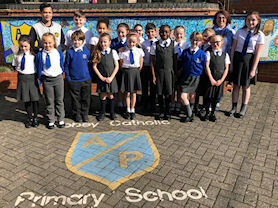 Our Chaplaincy Team were able to meet with another school, who are developing their chaplaincy to share ideas and promote our school's Catholic faith and mission. They were actively involved in the opportunity given to them and showed outstanding leadership skills throughout the meeting. They eloquently shared all they had achieved so far, and discussed the events they have arranged for the future. 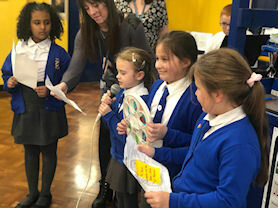 It was beneficial to all parties involved and the children were able to develop their public speaking skills and ability to synthesise their ideas to ensure others were able to understand. It was a pleasure to work alongside both chaplaincy teams to showcase our faith. Year 3 leading our Collective Worship. 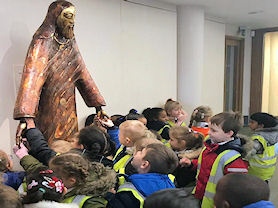 On Monday 11th February 2019, Year 3 led our whole school in Collective Worship. 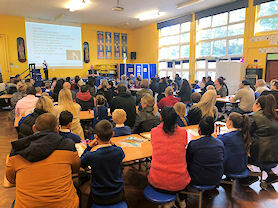 Parents and pupils gathered in the school hall as Year 3 reminded us of the importance of looking after the amazing bodies and minds that God gave us. Chaplaincy Team members reading to younger children. 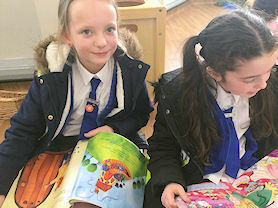 Children from our Chaplaincy Team were delighted to be able to share their gifts and talents by reading to children at a local day nursery. Our children are always so keen to be actively participating in all of the wonderful opportunities provided to them. We were delighted to be able to make links and support some of the youngest people in our wider community. A lovely afternoon was spent sharing stories, playing games and getting to know our new friends. We are really grateful for this experience and thank the staff and children at Butterfly Day Nursery for such a warm welcome. Ms Tallon speaking to the conference attendees. In February 2019, our Headteacher was invited to be a key note speaker at the Diocese of Salford Leaders Conference. She spoke about Leading a Faith Community and was very proud to share her experiences from our wonderful school. It was an honour and a privilege to be able to work with Catholic leaders across the country. Part of the retreat day for newly qualified teachers. Our headteacher is currently the Chair of the Birmingham Catholic Primary Partnership Head Teachers Association. Each year the association provide a retreat day for Newly Qualified Teachers at St Chad’s Cathedral. On 1st February 2019 we welcomed a wonderful group of NQT’s from across the diocese. Thank you to everyone involved in the organisation and delivery of this fantastic day. Please keep these new teachers in your prayers. Welcoming visitors to our school. 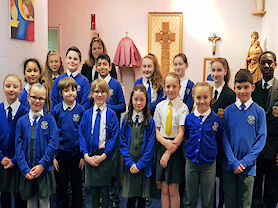 On 29th January 2019 we were delighted to welcome school leaders from Christ the King Catholic Primary School, Coventry. Our visitors had a wonderful day speaking to staff and pupils and sharing excellent ideas. We are very proud of our Catholic leaders across the diocese. 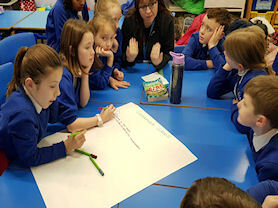 On 29th January 2019 our Pupil Voice groups gathered together as one in our Pupil Parliament. Our Pupil Parliament reviewed our Mission Statement: ‘Learning to follow in the footsteps of Jesus with our friends, family and Parish’. 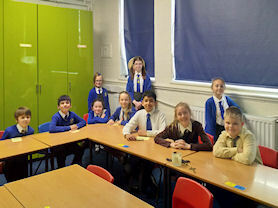 Each group reflected and reported on how their Pupil Voice group actively supports and promotes our school Mission. It was very clear that everyone was fully involved in promoting following in Jesus’ footsteps; an important part of Catholic life. As a group, we agreed that ‘family’ referenced not only the people we live with, but also our Abbey family. Each pupil group has been given a ‘go forth’ task to think about what else can be done to ensure our Mission Statement is a powerful , living vision. We will discuss these ideas further at our next Pupil Parliament session. 2KR treated the school and our Year 2 friends from Osborne to their class assembly with the theme being our virtues for this half term - Eloquent and Truthful. 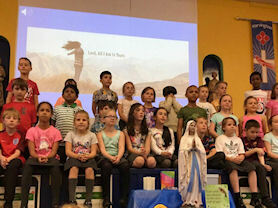 Using drama, music and prayer, 2KR explained what the words eloquent and truthful meant and also gave advice to everyone how they can try to be a little bit more eloquent like the disciples and truthful in their lives. The assembly finished with a challenge - To use their eloquence and truthfulness to share a fact with someone new. Would they find that they had something in common? 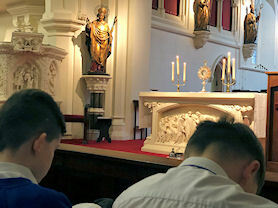 During the Spring and Summer terms in 2019, all pupils are involved in visiting the Abbey Church to participate in Exposition of the Blessed Sacrament. We are very appreciative of Father Maurice O’Mahoney CSSR , who is supporting this important aspect of faith development within our Catholic school community. Our show and tell assembly. As Catholics we respect other faiths and have enjoyed exploring how others in our modern Britiah community celebrate their beliefs. We held an assembly where we spoke with eloquence to share the curiosity we had in the faith we had been exploring. It was a great experience that taught us all why certain faiths do certain things. Moving forward it will allow us to show compassion to different faiths and become active in supporting their beliefs. One pupil leaving the assembly hall said, "I found it really interesting, I liked learning about how different faiths celebrate." Year 6 at the Greek Orthodox Church. Year 6 enjoyed a visit to the Greek Orthodox Church in Erdington as part of our International Week. The children had a tour around the church and learnt many interesting facts including how Orthodox Church should be built. During the trip, we learnt that there are many similarities between how we celebrate and prayer at The Abbey and how the Orthodox Church practise their faith. 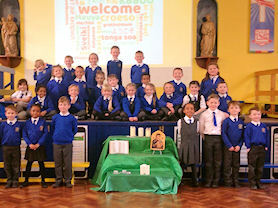 Year 1 during Multi-Faith Week. As part of our Multi-faith Week, Year 1 wanted to find out more about different faiths. We learnt about the Indian culture and Hinduism. We visited a Hindu Temple and were lucky enough to witness Hindu worship. 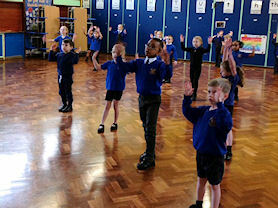 We looked at maps to locate India and had a go at some traditional Indian dance. In the forest area, we even made and cooked our own curry! Reception children at the Church. Reception were very excited to visit St Barnabas Church during Multi-Faith Week. Rev Freda and Rev Jocelyn met us at the entrance of their beautiful Church. They shared with us their role and also discussed some of the similarities and differences between their church and the Abbey. As it was ‘World Day of Prayer for the Sick’ we took the opportunity to ask Rev Freda to lead us in prayer for Fr Gabby and all the sick people in the world. On leaving, the children were given an open invitation to return with their families to take part in Mass or simply stop by and spend time in their Coffee Shop. Upon our return to school in January 2019, our Chaplaincy Team were delighted and surprised to have received a lovely certificate from Redditch SVP. Chaplaincy team had decided to use some of our fundraising profits to support the Christmas lunch funded and organised by Redditch SVP. The SVP kindly acknowledged our £500 donation with a beautiful certificate. 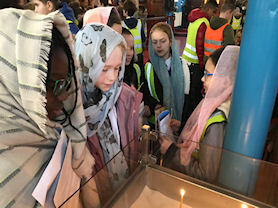 On Wednesday 9th January 2019, as part of our school’s multi-faith week, Year 3 visited Singers Hill Synagogue in Birmingham. We enjoyed learning about the Torah scrolls, the significance of the 12 pillars and 12 windows in the synagogue and particularly enjoyed the interactive aspects of our guided tour. 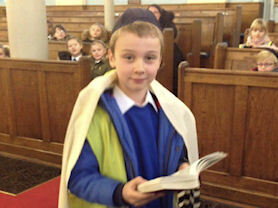 Everyone had the opportunity to explore special artefacts and some of our year group got to try wearing prayer shawls and acted out a Jewish wedding ceremony. Thank you to Bryan, our guide, who answered so many of our questions and provided us with such a valuable learning experience. Year 2 at the Pagoda. 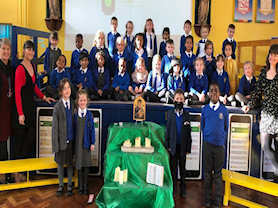 Year 2 spent Multi-Faith Week finding out more about China and the faith of Buddhism. We travelled to Ladywood to visit the Buddhist Peace Pagoda and were instantly struck by the beautiful golden roof. Year 2 eagerly listened to stories of Buddha who was born under a tree, gained knowledge under a tree (he stayed there for 6 years!) and died under a tree. We looked at the beautiful offerings of flowers, water and candles to thank Buddha and even got to try meditation. We had to cross our legs, close our eyes and focus on our breathing whilst listening to the sound of a bell. We then modelled how to meditate in front of the rest of the school on Friday. Year 5 at St Chad's. As Catholics we respect other faiths but wanted to find out more about our faith from the viewpoint of people who live in Birmingham and Italy. 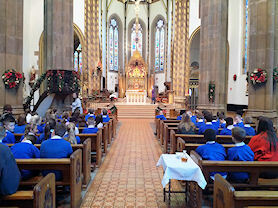 We visited St Chad's Cathedral and were lucky enough to celebrate Mass there. We learnt lots about who St Chad was and how he was a devoted Catholic and respected by many people. The love for him was shown when his bones were moved from house to house to ensure their safety. We also learnt about how the Cathedral was bombed, but luckily saved by the radiators, However it is marked by a tile on the roof inside. This trip was also an important trip for Year 5 as they begin their confirmation preparation, some children are now considering St Chad. One child exclaimed "I think he is a perfect Saint as he showed great devotion to God and sometimes suffered for it, just like our martyrs". 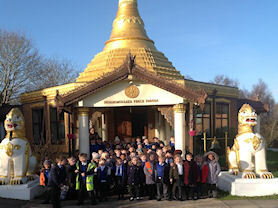 Year 1 children at the Temple. 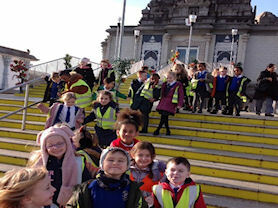 As part of Multi-Faith Week, Year 1 visited a Hindu Temple. Throughout the morning, Year 1 learnt about numerous aspects of Hindu worship. They were in awe of the beautifully and brightly decorated shrines. They were very respectful as they listened to many stories including how Ganesh got his elephant head. It was a very informative visit and we can’t wait to learn more about the Hindu faith upon our return to school. 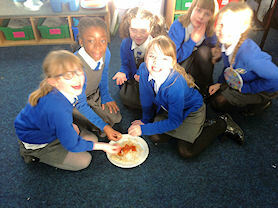 Year 4 tasting some Gambian cuisine. 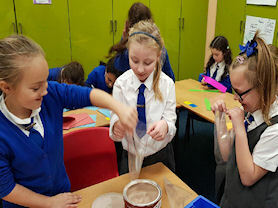 During the first week back after the Christmas holiday, the children in Year 4 were treated to an array of activities to celebrate Multi-Faith Week and studied The Gambia. Having located The Gambia on atlases and globes, the children looked into the climate and in particular what it would be like to live there and the life of a child their age at school. The children saw a variety of photographs from a school in The Gambia and made comparisons between school life in The Gambia and in Birmingham. It was great to see the similarities but also the many differences! The children also had the opportunity to sample Gambian cuisine, compose their own rhythm based on an African drumming session and were able to create a motif from an African dance. To conclude the week, the children studied The Islamic faith, created their own prayer mats and looked at what it would be like as a Catholic living in an African country. All the children thoroughly enjoyed the week and the many experiences that were available to them. Reception's presentation of the Nativity. Reception acted out the Nativity Story to friends, family and visitors. They sang, acted, danced and signed throughout the performance. The children did an amazing job of reminding us about the 'reason for the season' when God sent his only Son to us. We are all very proud of our youngest children in school! 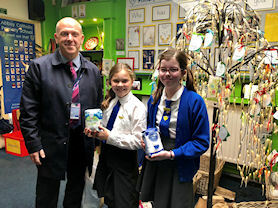 When our Chaplaincy team heard that our friends at Alton Castle were in need of funds for refurbishments, they came up with the idea of making Christmas gifts to sell. A lovely selection of decorations and edible gifts were made during after school sessions. We raised a total of £105.37. Working with Redditch SVP group. 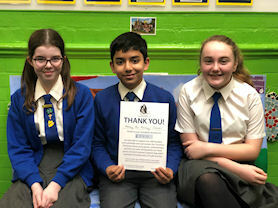 During December 2018 some of our pupils gave up their own free time to support the work of Reddich SVP (St Vincent de Paul) group. 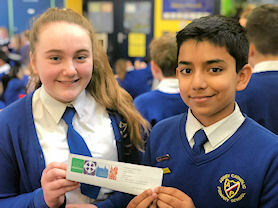 Pupils spent time putting shopping vouchers and Christmas cards in envelopes ready to be given to homeless people at the annual Christmas lunch on Saturday 15th December. We are very proud of the generosity of our families. When it is your child’s class Mass, families send in either a bag of sugar, jar of jam or tea/coffee to support Birmingham homeless. When our baskets are full, we deliver them to the Fireside centre. This December, we donated eight bags of sugar to the Reddich St Vincent de Paul group for their soup kitchen which runs in Birmingham City Centre. Our wonderful KS2 Carol Service. Our dedicated choir led a wonderful Carol Service for all of Key Stage 2 and parents. This special service was a mix of prayer, reflection and singing as we prepare joyfully for the coming of our Lord. We were thrilled to be able to share our 'Maranatha' again, this time for parents to enjoy. Choir were supported by a fabulous brass band made up of Year 6 students who entertained us with some old favourites. 4JB presenting their Advent assembly. 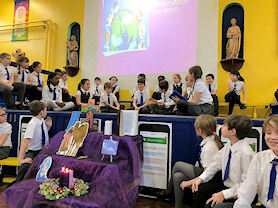 On Monday 10th December, the children from Year 4 JB performed a fantastic assembly all about Advent. 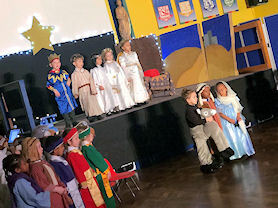 The school were treated to an array of Drama pieces that all showed the meaning and importance of Advent and where the word Advent actually came from. The narrators spoke eloquently delivering their important information with clarity and confidence. During our collective worship, Year 4 sang two beautiful songs showing that we were waiting for the coming of Jesus. Before closing the assembly with a special Advent prayer, the children gave everyone a challenge as their Go Forth message -which was to offer an act of kindness this Advent, even it is just a smile to someone who really needs it! Well done to all the children who delivered such an informative assembly. Hanging crosses on our tree. Instead of sending Christmas cards to friends this year, all children were encouraged to donate the money they would have spent on cards towards our Mission Together fundraising. 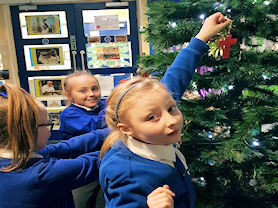 Chaplaincy Team decorated a cross with the name of each child who donated money and hung it on our school Christmas tree. We had an excellent response and a total of £204.50 was raised. This money will go towards their 'Together in Jordan' appeal. Thank you to everyone who supported our appeal. When Chaplaincy Team heard that our friends at Alton Castle are in need of help to fund refurbishments, we knew we wanted to help. We decided to make Christmas gifts and decorations to sell, and got together after school to get crafting! 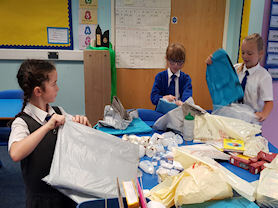 Eco Team also came along to help by making reusable shopping bags. We hope we make lots of money at our forthcoming sale. Our cheque for the Hospice. In celebration of Father Gabby's 50th anniversary as a priest we donated , in his name, £50.00 to the John Taylor Hospice in Erdington. 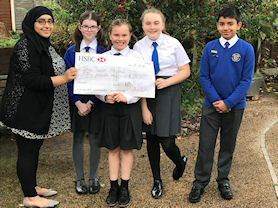 Our four school ambassadors were there to present the cheque to them. One of them said "I felt happy because I knew that the money would be able to help those people in need". We are very proud of our ambassadors, who are living out their faith and are eager to help their communities. Year 6 Sacrament of Confirmation. On Tuesday 16th October 2018 our reverent Year 6 Confirmandi invited Bishop Robert to celebrate their Sacrament of Confirmation. The children led a beautiful service and were all filled with the joy of the Holy Spirit. Thank you to all the family, friends and staff members, who have helped support our children in this part of their faith journey. Year 4 performed their assembly through acting, singing and poetry and demonstrated fantastic skill in all areas. Year 4 looked at how a small change can make a big difference. They explored the Pay it Forward concept and set the school a 'go forth message' to colour The Abbey with kindness the following week. At the FHC family meeting. On 9th October 2018 we welcomed Year 3 children and their families into school for a workshop on First Holy Communion preparation. Father Maurice spoke to families and reminded them of the importance of taking this journey as a family. He reminded us all of the importance of being a full member of the Church. We are looking forward to working together as school, home and Parish on this faith journey. Visiting Headteacher and two of our ambassadors. On 4th October 2018, two of our ambassadors were delighted to welcome the Headteacher from Christ the King, Coventry. We were delighted that he joined a leadership meeting, toured school and spoke to children and staff. It is always a pleasure to welcome and support staff from other Catholic schools across our diocese. Ms Tallon and Headteachers from across the UK. 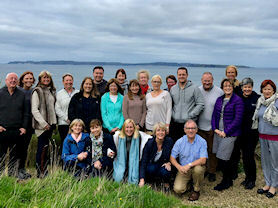 Our Headteacher was honoured to be a part of the group of 25 Catholic Headteachers from across the UK, representing the National School of Formation, attending another amazing visit to Corrymeela. 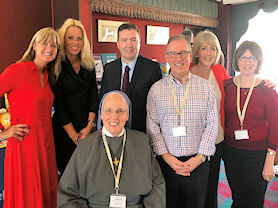 The Headteachers met with some remarkable speakers; Padraig O'Tuama on Brexit and the book of Ruth, Derick Wilson on restorative practice, Welma Villar-Kenndey on Transforming division through human encounter and Paul Hutchinson on faith and life. Thank you everyone at Corrymeela and EducareM who made this possible. Abbey Catholic Primary School take the formation and spiritual development of staff very seriously. Governors are committed to investing in high quality professional development in Catholic Life, Collective Worship and RE. 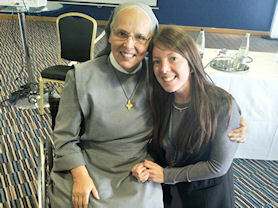 We are proud to access the Birmingham Catholic Primary Partnership training and particularly enjoyed working with Sister Judith Russi in September 2018. Collective worship led by Y5JM. 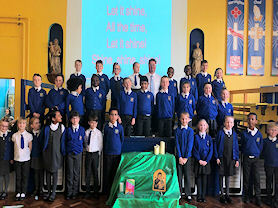 On 24th September 2018, Year 5JM led the whole school in a beautifully designed Collective Worship. Pupils allocated roles within their special assembly and demonstrated amazing skills of drama, song, poetry recital and public speaking. Year 5 sent us all out into modern Britain with a ‘go forth message’ to consider what we can do to get ourselves closer to our dreams. To act positively to become the people God has called us to be. Donating bags of sugar for the homeless. On 20th September 2018, two of our ambassadors presented bags of sugar to a member of the St Vincent de Paul (SVP) society. These bags of sugar will be used in the SVP soup kitchen held in Birmingham City Centre. Thank you to our wonderful families who demonstrate caritas in action by donating these essential items to school. It was a great pleasure to welcome our new Reception pupils into our Parish community. We celebrated a beautiful Mass at the Abbey Church and were thrilled to see so many of our Year 5 buddies supporting their peers and joining the celebration. We then joined as a faith community back at school for breakfast; thank you to all our reception parents who brought in food for us to share, it was enjoyed by everyone. We are looking forward to watching our new cohort grow into the person God has called them to be and are excited to be part of that special journey, 'following I'm the footsteps of Jesus, with our friends, family and parish'. Blessing the classroom and talking to the children. 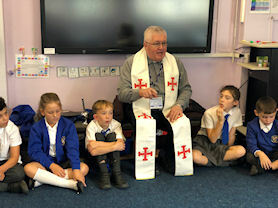 During Autumn 2018 , Father Maurice will be visiting each class in school. He talked in detail to the pupils and staff before giving each special learning space a personal blessing for the upcoming academic year. The Chaplaincy Team filling up the prayer bags. Chaplaincy Team met for the first time this academic year to fill our new Prayer Bags. Each bag has different items in it that will help promote prayer and deepen understanding of faith. We know our families enjoy sharing prayer together, we can't wait to hear what you think of them. Joining together for prayer via weblink. On Tuesday 11th September 2018 our school community joined together with all other Catholic Primary Schools in the Archdiocese of Birmingham in special prayer. 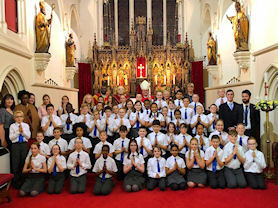 Our pupils joined the Archbishop via live weblink in Adoration of the Blessed Sacrament. Delivering our donations to Fireside. 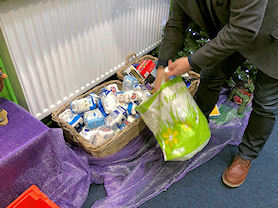 The Chaplaincy Team travelled the SIFA Fireside to deliver our donations of sugar. Each pupil is asked to donate a bag of sugar when it is their class Mass, reminding us that these charitable acts are an integral part of our faith. Fireside were really grateful for our donations which make such a difference to the people they support. Two of our Chaplaincy Team visited the Holy Shop at St Chad's Cathedral to stock up on exciting new resources for our school prayer bags. A range of different items were bought to appeal to children if different ages and help them grow in faith. We look forward to sharing them with our families. As a welcome back to school all children participated in a whole school assembly. We explored the idea of being a witness to God and discussed that Christ should not be a secret and that He should be celebrated. Therefore, as a Catholic community we are going to ensure we are being God's witness' and spread his love to all that we meet. 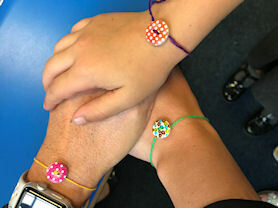 Children were given a button and piece of string to make a bracelet. This represents God's never ending love for us all. As a Catholic community, we are following scripture and 'being the light, bringing out the God colours in the world' Mt 5:14. Please help us on our mission to become true witness' of God. The staff show they are Christ's light. 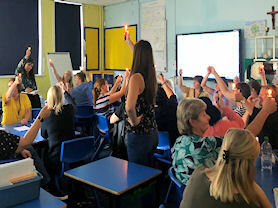 Staff are excited to enter the new academic year and worked collaboratively to show how we are Christ's light. All staff produced motivational presentations to represent how we can spread God's message and 'set the world on fire'.